Franks not too nervous...Though he&apos;s never met this man. But he oddly feel a sense of comfort enveloped around him as Gerard sent a confirmation text. He knows nothing about him, true, other than the fact that he&apos;s depressed. Why, he&apos;s not completely sure. Frank didn&apos;t want to delve into his personal life when he was already struggling so much. Will he ever trust Frank? He do any even know if they&apos;ll  get along or have anything in common. He turned off his shower faucet, and tried to soothe his worrying. Maybe Frank is nervous after all, he has a tendency to rub people the wrong way. Today will be a good one, he thinks though. He trudged out of the shower, towel wrapped securely on his waste as Frank picked out my clothing for the day. Something casual, he thought. Something to spark a conversation. He slipped on an Iron Maiden t shirt and some plain black jeans. He quickly checked his hair, disheveled as he liked it. He&apos;s not super out there looking or anything. He&apos;s attractive, totally classic and handsome features, so he liked to keep and edge to his look to remain intriguing. He grabbed his car keys, wallet, and phone as he stepped out into the brisk winter air of New Jersey. He took his beaten down car, Frank would usually walk, but seeing as it has enough miles on it already, and it&apos;s a few miles away and he didn&apos;t want to get sweaty. He doesn&apos;t always make the best impressions and didn&apos;t want to add that to the list. It was just a small local coffee shop, no sign or anything. A hole in the wall called "Coffee Cafe." Literally. He felt a slight pinch of nervousness as he entered. He was about two minutes late and assumed he might see Gerard. He looked around, and didn&apos;t see many people, but noticed someone anxiously looking too. He was average height, pretty normal weight, had dark ebony shoulder length hair, crystal clear hazel eyes, pale snow white skin, a grey sweater, and black jeans like him. Frank couldn&apos;t see any signs of a person who was just about to attempt, seeing as he&apos;s an attractive man who looked like he was ok. He realized he had been staring, trying to analyze this person as the man locked eyes with him. Frank decided to walk up. 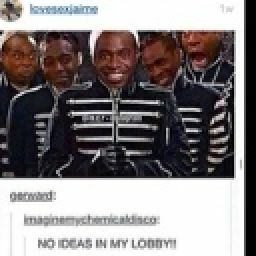 "Hey.... Are you Gerard?" Frank noticed the man let out a small huff of air and visibly calm. "Yes, and you&apos;re Frank right?" Frank smiled and nodded, "that would be me", he laughed awkwardly as the coffee shopped filled with silence, just the whirring and buzzing of machines. "Wow.. I love your shirt, they&apos;re actually one of my favorite bands." Frank was intrigued. Gerard seemed cool as hell, but only felt worse for his situation. "Really? I play most of their songs on guitar. I love them." "You play? I did as a child, I still do every now and the but I&apos;m not very good." "Ah I bet you&apos;re better than me Gerard, can I buy you a coffee?" "You honestly don&apos;t have to... I may be fucked up but I have money and everything..."
"It&apos;s seriously nothing, come on, it would be an honor." 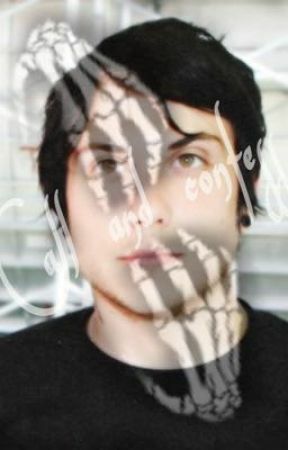 Frank watched as Gerard let out a small smile and mumbled a thanks, they both ordered.